Delicious, thick and creamy tasting Müllerlight Greek Style yogurt has won a top consumer choice award less than a year after launch… And it’s not a myth! Scooping the title of Product of the Year for 2013 in the Healthy Yogurt Category marks another milestone for the brand which has already clocked up sales on over 61 million pots in just 42 weeks. Müller has confirmed that the milk price for its non-aligned liquid contracts will increase by a further 2ppl from 1 December. 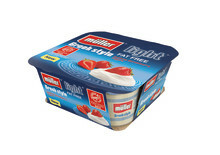 From 26th September, Müller Yogurt & Desserts will launch its reformulated popular Kids Corner brand by changing the recipe to include 50% less added sugar, reducing the total sugar content to 10% per 100g. ​Müller has confirmed a reduction in its standard milk price of 1.35ppl from 1 April 2016, against a backdrop of unprecedented levels of farm milk production forecast for spring, coupled with weak market demand.